This fine-dining restaurant on the bayfront features a delicious and diverse menu paired with a comfortable and elegant atmosphere. 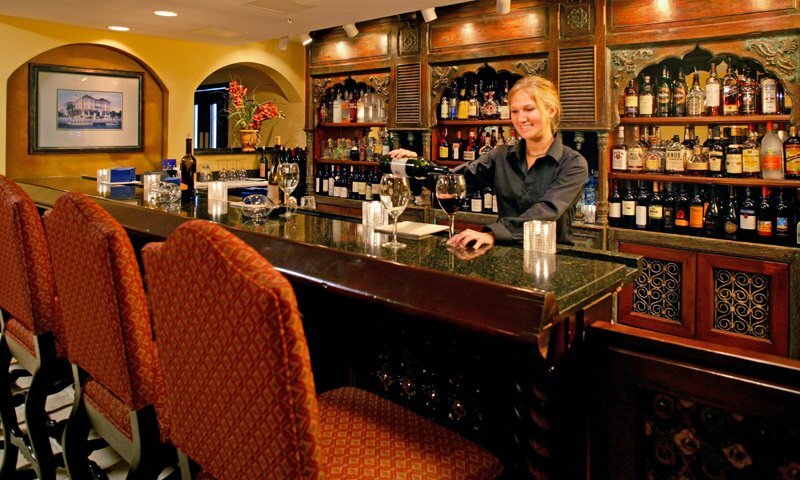 Avilés Restaurant & Lounge is located in The Hilton Historic Bayfront Hotel in St. Augustine, Florida. This fine-dining restaurant offers a variety of dining choices, combined with a Spanish-style atmosphere. The menu is a fusion of traditional dishes of Spain, France, Asia, and the Mediterranean. Avilés Restaurant & Lounge is open for lunch and dinner. The tone of the restaurant is set by the lavish décor, featuring black marble tables and Spanish-inspired high-back chairs. Their menu has been crafted by their award-winning chef and emphasizes freshness and quality in every dish they prepare. The excellent service adds to the overall experience. This is wonderful choice for a romantic meal or any kind of special celebration. Avilés Restaurant also offers complete banquet facilities and catering. Have eaten there a few times. It was considerably better about 3 years ago. Standards have fallen as prices have risen. It appears that the Hilton has little interest in sustaining a relationship with locals since the prices are, in many instances, very high. All in all, artifice and pretense prevail, and though good, the experience can leave a bitter taste in your mouth. There was nothing impressive about this meal except the backlighted menus and the manager wanting to make it right. My steak was supposed to be medium and came out chewy with a burned but thin outer layer. The meat was cooked on too high a heat. It made the steak taste like charcoal. The salad was also equally unimpressive. Was offered a bottle of wine in recompense but I had no interest and just left the place. I always see the restaurant everytime we visit St. Augustine, and tonight my family and I finally had the chance to try it. We love it; the food, the service, the ambiance... it's fine dining, but very affordable!... this won't be the last time we'll visit the place! Can't say enough good about the delicious food in the elegant atmosphere and the service is surperb there! Highly recommend this restaurant for any meal, breakfast, lunch or dinner.